From the 1700's , this is as fine a piece of ash burl as one could hope to find. Each 120 degrees of rotation brings a new and fine spectacle to eye in this exceptional burl creation. The design created in the turnings is the finest . . . from the gracefully turned lip to the linear repetitions of the base. The maker was truly an artist, expressing his artistry in the selection of the burl, the discovery of the designs inherent in the burl and finally, the mastery of the turning in both design and creation . . . certainly one of the "best". 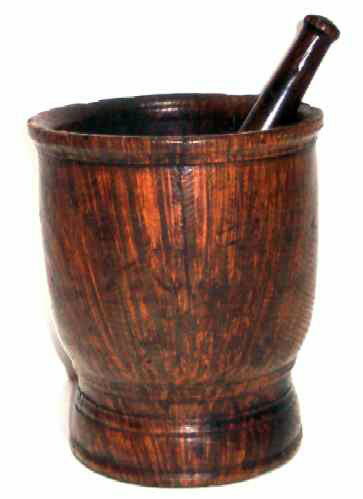 To further "gild the lily" this fine maple burl pestle has assuredly spent its life with it's friend, the mortar. Hard as a rock, but worn and polished by time, it is a beauty unto itself and a rarity in its genre. 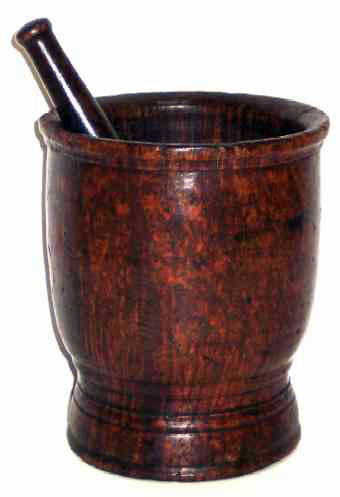 The mortar stands 7" high and is 6" in diameter at the top.